I've been using this every day for a couple of weeks and my skin looks so much clearer. After removing my make up I spend a good few minutes massaging this in to my face, focusing mostly on my chin and forehead. Although still far from perfect, I haven't known my skin to be this clear in a very long time. Time will tell as to whether this is a temporary effect of a whole new skincare routine, but for now I'm very happy. After a little bit of trial and error with a few different products I've learnt that my skin seems to respond best when I use an oil before my moisturiser. If I use too many heavy products though it can quickly start to look and feel overwhelmed. I decided to try jojoba oil, which is hydrating but not too greasy, and it seems to be working well for me so far. This is the biggest tube of eye cream I've ever seen, but I'm certainly not complaining. When it comes to eye cream I don't really expect too much from it aside from hydration, and lots of it. Again I've been using this morning and night for a few weeks and so far, so good. I've also been using it around my nose and on my forehead as I usually have a lot of dry patches in these areas but they now seem to be a thing of the past, and for that I am more than grateful. Finding the perfect moisturiser has been a journey. Everything is either too heavy, not moisturising enough, or gives me some kind of strange allergic reaction. I've chosen to go with this one for now because it only has a few ingredients. It's moisturising but not too greasy and so far I really like it. Unfortunately I can't seem to find any solid clarification on Weleda's cruelty free status*, so my moisturiser journey isn't quite at an end just yet. I think my next purchase is going to be the Laidbare Working 9 to 5 Hydration Cream, but I'll keep you posted. 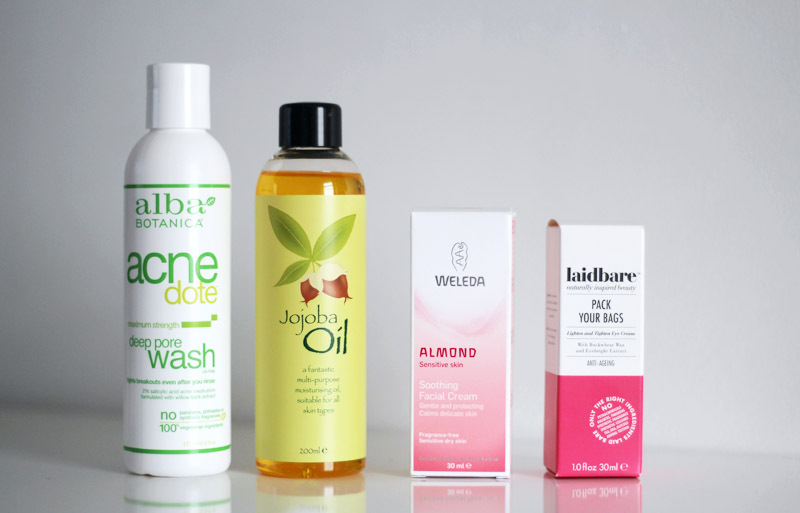 *Weleda reached out to me and alleviated the concerns I had by clarifying their position on animal testing. I would now feel comfortable purchasing more from their range. What is your favourite skin care product of the moment? My favourite skin care product of the moment is Kukui oil. It's easly absorbed without a greasy film and helps provide moisturization and healing. Laid bare Eye Cream looks really good! I haven't tried it ye, is it worth the hype? By the way, your blog design looks dreamy. Weleda is cruelty-free as far as I know. I found my information on German sites, which is easier I guess, as the brand is German as well. They offer a small product selection in China, but only in parts where there is no testing needed, so they don't have to test on animals. I really love their products and I'm glad they have such a strong anti-animal testing standpoint. The face wash sounds really good! It's so hard to find a good cleanser that fights blemishes but isn't drying.